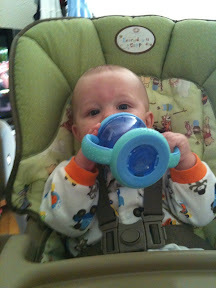 Today I introduced Tristan to the sippy cup and it went great. I sat the cup in front of him, he picked it up, put spout in his mouth and sucked out a drink like he'd been doing it his whole life! He never stops surprising me with how smart he is.